Your Master Password is your secret key to the data stored in your Dashlane account, that only you have access to. 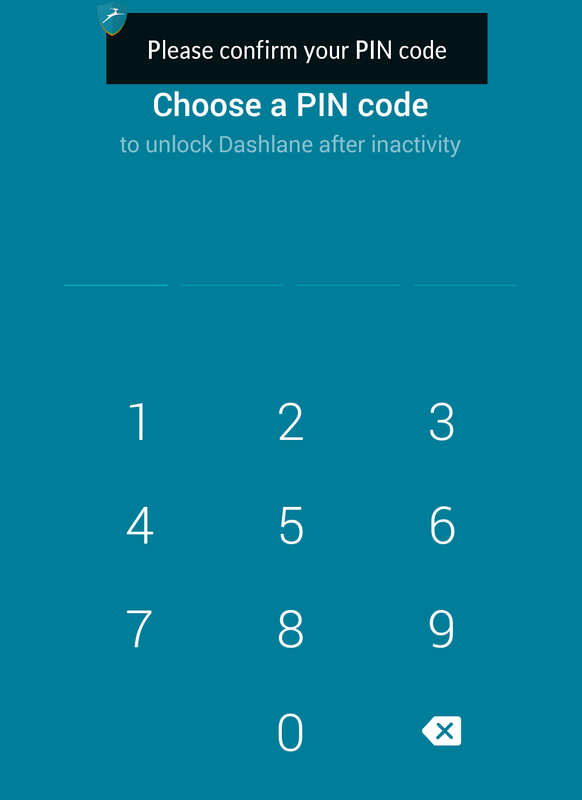 But instead of typing this long, complex password every time you visit Dashlane on your Android device, you can set up either a fingerprint or PIN code to unlock the app. 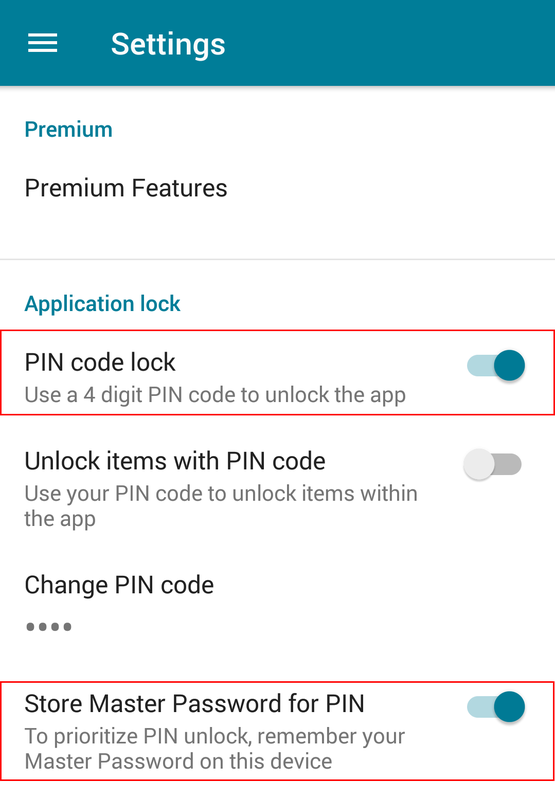 This article here focuses on the PIN code mode. Please refer to this article for the Fingerprint feature. You can watch the video walkthrough here. Why do I need to enter my Master Password? When you open Dashlane, you will always need to put in your Master Password in order to launch the app. This is because it is required to decipher your data. Your Master Password is neither stored in the application nor on our servers, which means that the only way to access your data is to enter your Master Password. 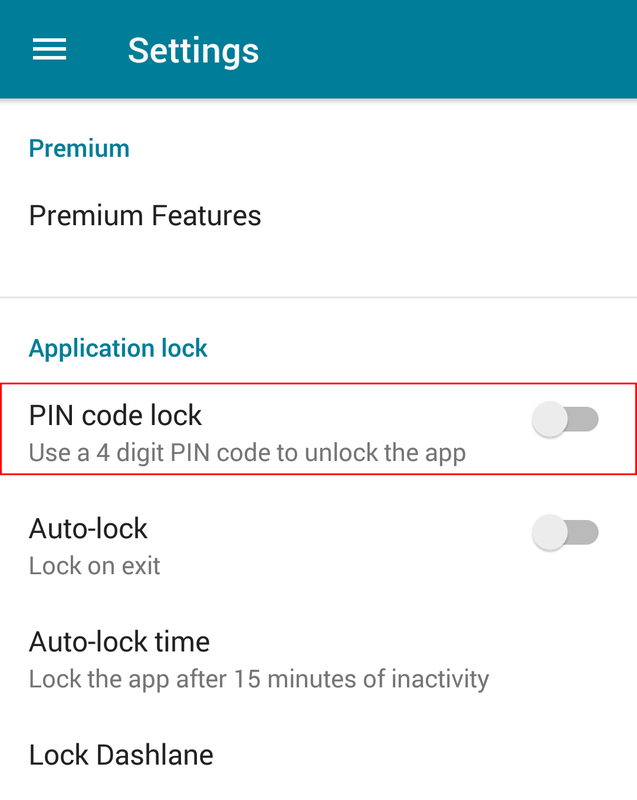 But once you've logged in, you can set up a PIN code so that you don't need to enter your Master Password every time you open the app. From the main menu, tap on Settings at the bottom of the page. Tap the OFF button to turn on the PIN code lock. Then, you'll be able to choose 4 numbers to use as your PIN code and you will have to confirm this choice on the next screen. After confirming your PIN code, you will also be offered the possibility to let your device remember your Master Password. This will prioritize PIN code unlock in the future. Please note that you will periodically have to enter your Master Password instead of your PIN code when signing in to your Dashlane account for security reasons. 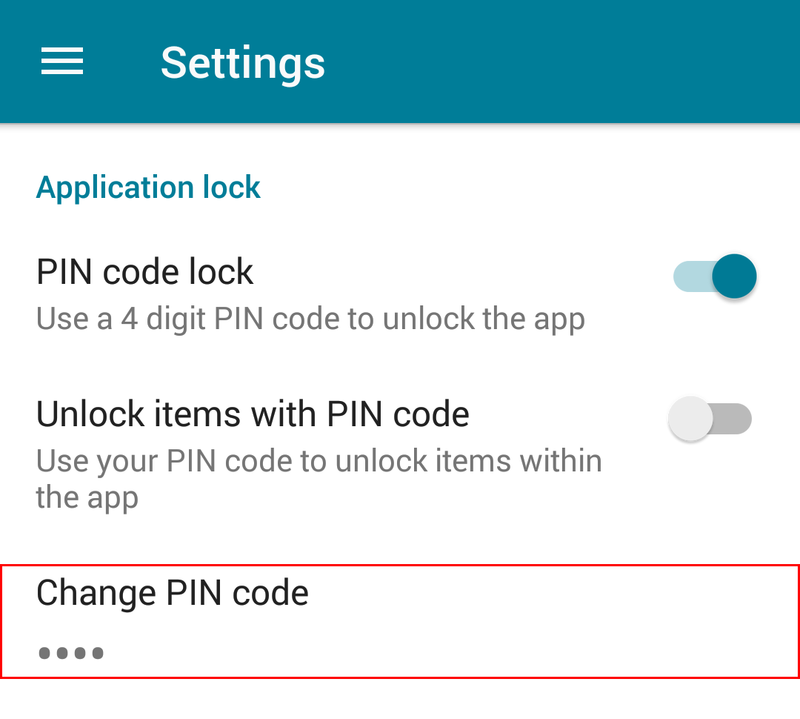 You can change your PIN code at any time in Settings by tapping on Change PIN code. 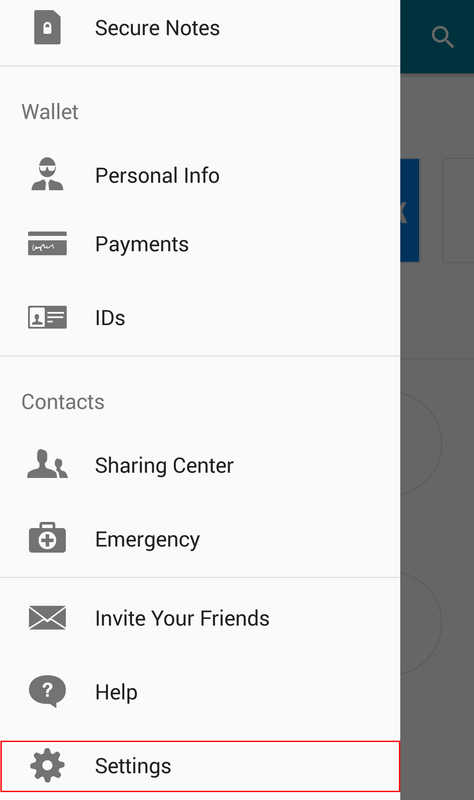 Then, you can set a new set of four numbers to use as your new PIN code. If you forgot your PIN, don't panic. 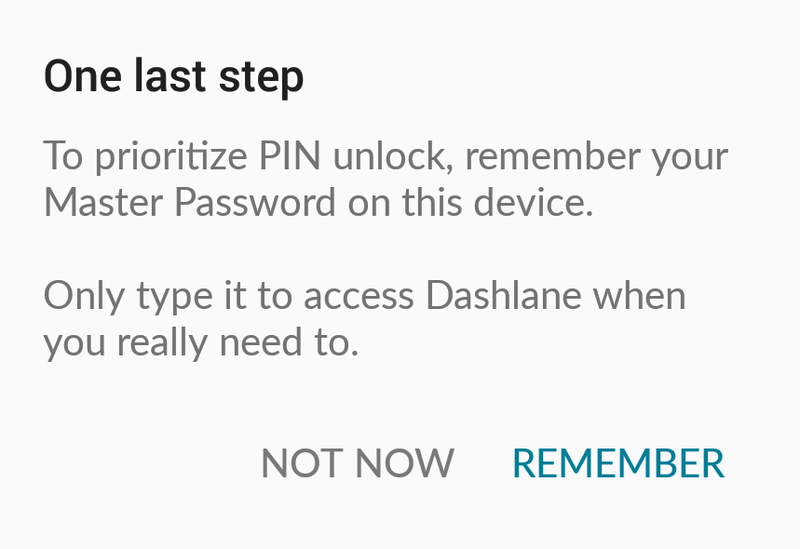 Enter a false PIN three times and Dashlane will ask you for your Master Password in order to unlock the application. 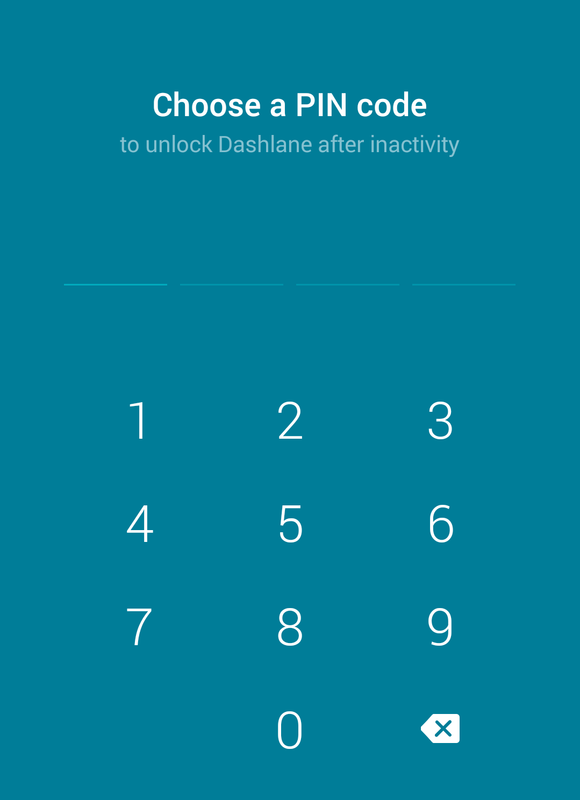 You will be able to disable/enable the PIN again and choose another code. 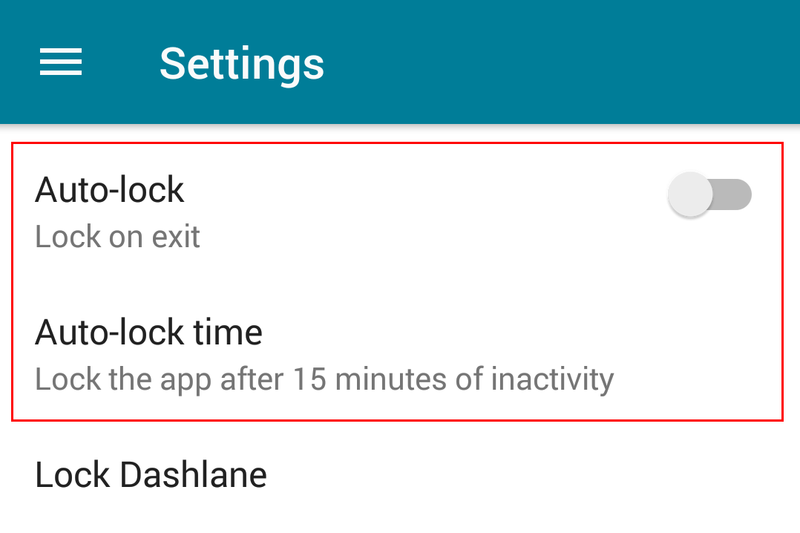 You can set a timer to your app so that it locks automatically after a certain period of inactivity. This is useful, especially in case your phone is stolen and you want to make sure no one can access your data. You can choose a time between 5 seconds and 15 minutes. You could also disable this by selecting "Never", but we don't recommend this setting as it's not very secure. If you've enabled this feature, then the app will automatically lock whenever you leave it. We recommend that you keep this setting ON as it provides more security. You can find these two features in the Settings menu under Auto Lock.